TULSA, Okla. (November 26, 2017) Just under two weeks before the early entry fee for the 33rd Lucas Oil Tulsa Shootout goes up to $120 per class, the list of drivers making their way to the Tulsa Expo Raceway has climbed to 295 with those Golden Driller hopefuls combining for 625 entries among eight classes of competition. Just ahead of last year’s entry count at this time, the list of drivers that make this year’s growing roster includes 2017 NASCAR Camping World Truck Series Champion, Christopher Bell. Entered into five divisions for the coming Tulsa Shootout, Bell was busy this past weekend adding two more wins to his season in USAC National Midget competition at the 77th Turkey Night Grand Prix, then in ASCS Southwest Regional competition at the Copper Classic. Bell is currently entered in both divisions of A-Class and Outlaw, as well as the 1200cc Mini Sprints. In the 32nd edition of the Tulsa Shootout, Bell’s best finish came in the A-Class Non-Wing Feature with a run from seventh to second as Frank Flud picked up his second career Non-Wing win and fourth overall Golden Driller since 2014. Bell would go on to win the 31st running of the Chili Bowl Nationals. One that subject, the use of the Shootout as a practice for the Chili Bowl has become very common. At last count, Bell is among 11 drivers so far that are entered into both events with four having captured at least one Tulsa Shootout triumph. To this point, 22 drivers on the docket have parked in Victory Lane in Tulsa Shootout competition. Blake Hahn leads the Golden Driller among drivers entered with seven, having won in Junior Sprints, both divisions of Outlaw, and ECOtec Midgets. Seven of last year’s winners are set to return. The roster for the 33rd Lucas Oil Tulsa Shootout can be found online at http://www.tulsashootout.com/profile/schedule/results.aspx?r=210996&rt=sch. Discounted early entry will take place until Wednesday, December 6, 2017 with the cost per entry at $100. Entry fees rise to $120 per class the following day and will close on Tuesday, December 19, 2017. After, that, any new entries will be taken on Wednesday, December 27, 2017 during parking. Open 24-hours is the online portal through http://www.tulsashootout.com. Teams can click the Pre-Entry link located at the top left of the Tulsa Shootout web page. This requires that you create at MyRacePass.com account if you don’t already have one. The account is free. Entries can also be taken by phone at (918) 838-3777 Monday-Friday between 9:00 A.M. and 5:00 P.M. (CT), by Fax to (918) 836-5517, and by mail to 1140 S. 83rd East Ave. Tulsa, OK 74112. A downloadable entry blank is available on the home page of the Tulsa Shootout website. 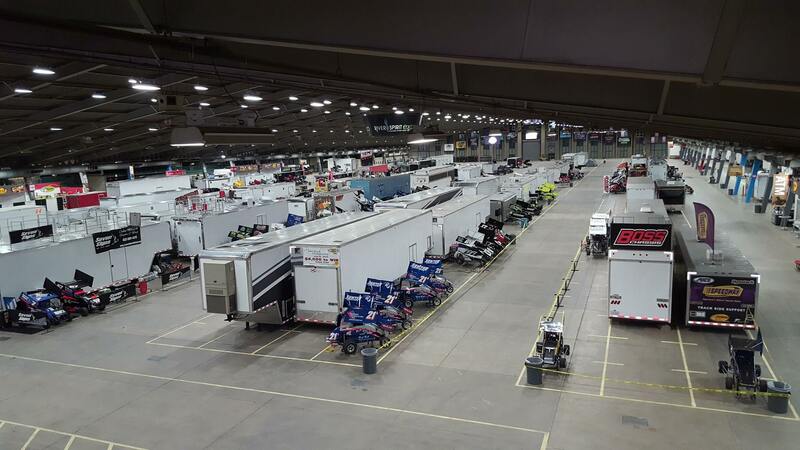 Classes for the 33rd annual Tulsa Shootout include A-Class (Wing, Non-Wing, and Restricted), Outlaw (Wing and Non-Wing) ECOtec Midgets, 1200cc Winged Mini-Sprints, and Junior Sprints for a total of eight divisions. Opening day of racing on Thursday, December 28 will start at 9:00 A.M. with Practice for classes, followed by Heat Races that evening. Start time is tentative for 4:30 P.M. and can change depending on how long it takes to run all teams through their hot lap sessions.